The community is invited to join the Seattle NE Rotary at noon on Thursday, September 8 at the Elliott Bay Brewery in Lake City for its Congressional Candidates’ Forum. 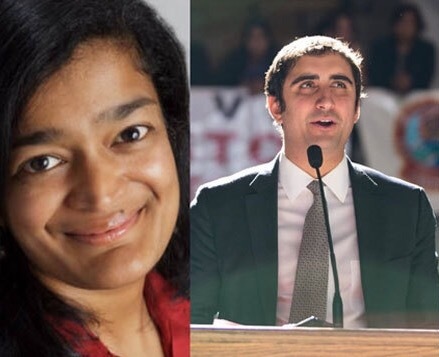 Rep. Brady Walkinshaw and State Senator Pramila Jayapal will speak and answer questions following the no-host luncheon in the brewery’s downstairs banquet hall. Jayapal and Walkinshaw, both Democrats, are competing for the Seventh District seat, known to be one of the safest seats for the Democratic Party in the US. The Seventh District has been represented by Congressman Jim McDermott since 1989. Prior to serving in the Legislature, Jayapal founded Hate Free Zone, an immigrant rights nonprofit, now called One America. Jayapal, of Indian-American descent, grew up in Indonesia and Singapore and became a US citizen in 2000. She is author of the 2000 book, Pilgrimage: One Woman’s Return to a Changing India, and is endorsed by The Stranger. Walkinshaw, an attorney, worked previously for the Gates Foundation. Of Cuban-American descent, Walkinshaw is fluent in Spanish. He is endorsed by the Gay and Lesbian Victory Fund and the Seattle Times. The Seattle Northeast Rotary has served the community for nearly fifty years, most recently with a focus on worldwide polio eradication and helping meet the basic needs of local residents. The club meets each Thursday noon at Elliott Bay Brewery in Lake City.